I know, I know. Marie Kondo, in her book, The Life-Changing Magic of Tidying Up: The Japanese Art of Decluttering and Organizing, clearly states that you should commune with your belongings in private and in complete silence so that it’s easier to decide what to keep and what to discard. However, I think many of us use music as a motivator, a calming presence, good company or for many other reasons. Music is pretty much playing non-stop. So, now that my tops are done, I’ve created a playlist that I hope you’ll enjoy. I chose these songs for my first KonMari playlist because their titles offer a tongue-in-cheek view of our attachment to things and the decisions we need to make as we’re tidying things up. Heartbeat – because our hearts are racing to get started – and to finish! Vampire – because all this extra stuff is sucking the life out of us! and The Whiskey Charmers (Whiskey Charmers ) are two that I’ve come to love because of Theme Attic. I hope you enjoy this little respite from all the hard work involved in tidying the KonMari way. Let me know your suggestions for good cleaning music! Come back again to see how I do with my next few categories. Thanks for stopping by! This post contains referral and affiliate links. However, all opinions are my own. This entry was posted in KonMari Method, Organizing and Tidying, Playlists and tagged A Little Less Conversation, Bing Crosby, closet organizing, clothing organizing, Dia Frampton, Dido, Elvis Presley, Glee cast, Grace Kelly, Heartbeat, Heartless, Help, I Need You, Jillian Rae, KonMari Cleaning Playlist 1, KonMari Method, LeeAnn Rimes, Marie Kondo, Organizing, Peter Waldman, Phil Maq, playlist, Spotify playlist, Thank You, The Beatles, The Clean Up Song, The Life-Changing Magic of Tidying Up, The Whiskey Charmers, Theme Attic, Tidying, True Love, Vampire, WHFR.FM on October 30, 2015 by Cindi. Thank you for coming along with me on this journey and I do apologize for the lapse between posts, but once you get started on this journey, it seems to take on a life of its own. I’m further along than my posts indicate, and I’m putting a lot of thought and analysis into what I post, so it’s taking me a bit longer to get my info out than some others might. However, I do hope that we both learn along the way! 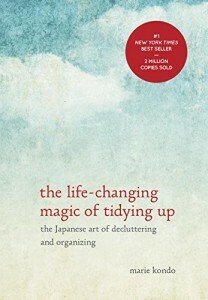 When we last visited, I had just begun working my way through the categories as recommended in the book, The Life-Changing Magic of Tidying Up: The Japanese Art of Decluttering and Organizing by Marie Kondo . 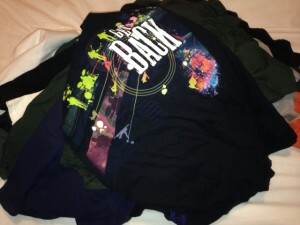 Clothing is first up, and I did my energy test of my t-shirts, to see if I could feel the joy with my eyes closed. You can read the post here. Next it was time to tackle tops. I hate to admit it, but even though I seemed to have quite a few in my closet, i gravitated to the same dozen or so and wore them over and over again. I’m sure everyone was sick of seeing me in the same ones, but I really liked the way I looked in them and they were quite comfortable. It’s hard to argue with comfort. 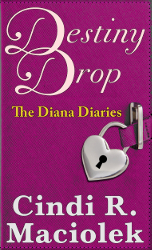 However, as the book title states, this process is supposed to be life changing, so it was time for me to take a hard look at exactly what was on those hangers! I began with my winter season tops as it was the heat of the summer when I was doing this, so long-sleeved sweaters were the last thing on my mind and probably the easiest to form an objective opinion about. In fact, Kondo suggests working on your off-season clothing first. Makes total sense. I got a little cocky after my t-shirt experiment and decided just to hold the hangers, not the actual clothing, as I made my decision. I quickly went through my winter tops as I don’t have that many living here in the desert, sorting by what to keep versus what to discard. This time, I took a more objective stance and made the choice simply by whether or not it had been worn enough times to make it in the record books. Yes, even if something brings you joy, at some point you must thank it for its wonderful service and pass it on. 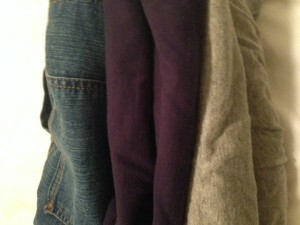 I initially discarded about 20 percent of my winter tops, then hung the remainder back in my closet. My clothes are always organized by color within each category in my closet, and as I was hanging them, i realized I could part with a few more. Once they were all hung, I pulled out even more. It seemed as if my closet was creating a certain look – hopefully, my look – and those items that no longer fit really stood out. I ultimately went through my winter tops about four times. Probably would have been easier to do it the KonMari way in the first place. 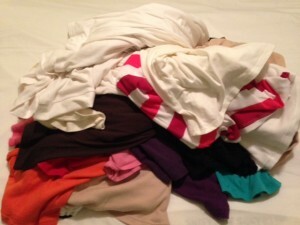 In the end, 45 percent of my winter tops found their way into the discards. Unfortunately, I was so busy playing the hanger game I neglected to take photos at the start of this category. Here are the keepers. Here are my joyous winter tops, no ugly Christmas sweaters in the bunch! Once winter tops were out of the way, it was time to address all my three-season tops. Here, again, I found that I was wearing the same few over and over again.. 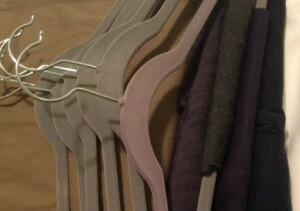 I decided this time to take them off the hangers to sort them properly. As I was deciding which brought joy and which should hit the discard pile, i realized i had several i didn’t even know I owned! In fact, price tags were still dangling from the seams. 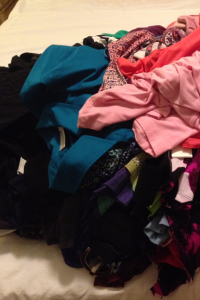 So, I actually had to make a third pile – try-ons – to determine which could stay and which could go. As it turned out, i kept over half of the tops with tags. As for the rest, even if they fit and were in good condition, if they didn’t bring a smile to my face, i bid them adieu. Overall, i released 41 percent of my three-season tops into the universe. Then came the basics: camis, tamis and tanks. This category took up a big section of my closet, but after reading Kondo’s book, I decided i would fold these and place them in a drawer. When they hung in my closet, i grouped them by color rather than style with the mindset that they all go under some other article of clothing – from a top to a jacket – so I would probably decide on color then select a style. 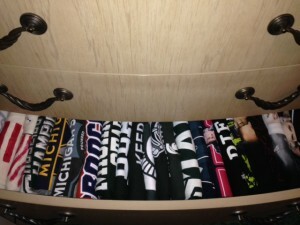 Well, I’ve had a change of heart and decided to separate them by category, then color, when I folded them in my drawer. As it turns out, I didn’t realize I had certain items because of the fact they were colorized not categorized. As these are basics, I can’t really say they offer any overabundance of joy. I use them as needed. So, i turned on the big overhead light in my bedroom and checked for condition. I had a number of new ones here with tags still on, but several had seen only one or two uses. i kept 69 percent, and spent several minutes folding and categorizing them for the drawer. Don’t they look pretty? Here’s the mess of camis, tamis and tanks before the big folding session. Here they are all nestled in the drawer. 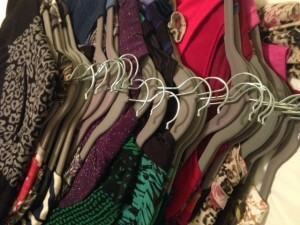 Even using Huggable Hangers, I save a lot of closet space by folding them. I highly recommend using the brightest light you can when making these clothing decisions. Harsh lighting exposes a multitude of sins. Besides, if something brings you joy under those circumstances, just think how happy you’ll be in candlelight! Now that tops are done, what category will I do next? Come back and see! 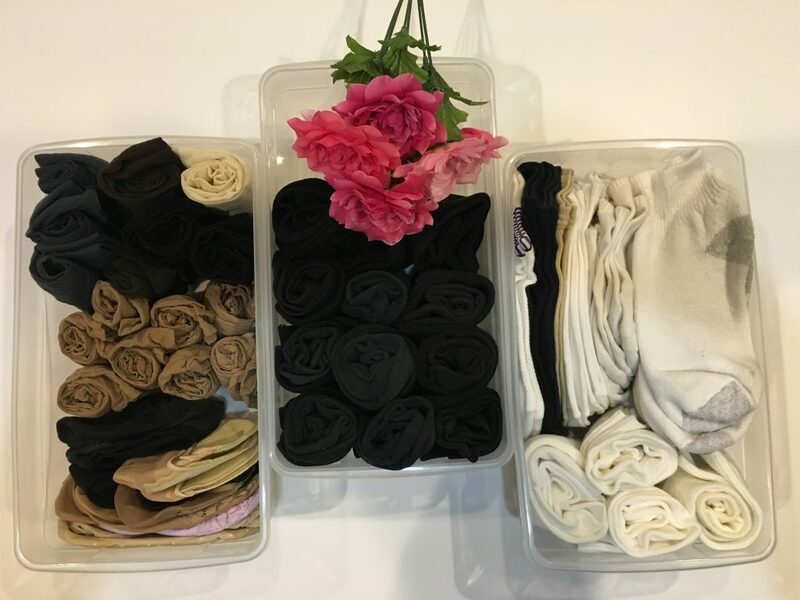 This entry was posted in KonMari Method, Organizing and Tidying and tagged closet organizing, clothing organizing, Does this spark joy>, KonMari folding, KonMari Method, Marie Kondo, Organizing, The Life-Changing Magic of Tidying Up, Tidying on October 22, 2015 by Cindi. I think the book, The Life-Changing Magic of Tidying Up: The Japanese Art of Decluttering and Organizing by Marie Kondo , is all about challenging yourself to think differently. And, for me, I decided to face things head-on! Kondo highly recommends sorting and clearing through your stuff in a very specific category by category way. First stop: clothing. For me, that began in my closet. 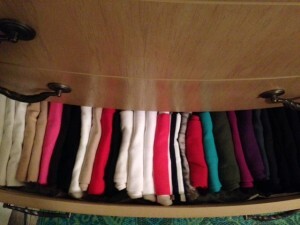 One reason I was excited to start on the closet was as a personal challenge. The walk-in closet in the master bedroom is seemingly adequate for two people. However, I have overtaken every square inch of space in it – in addition to a full nightstand and six-drawer chest. If I were married, I have no clue where my husband’s clothes would go. One nightstand is kept empty for that purpose; however, the closets in the other two bedrooms are unavailable. One is for my office and the other is in my Mom’s bedroom. So, there is only this one closet for two people. The house does not have a linen closet, so all sheets, mattress pads, comforters and other bed linens must be stored in the closet as well. i took “before” photos of my closet, but i’m not going to include them in my posts just yet. I’ll wait until I complete my clothing purge, catalog everything in Stylebook, sell some discards on eBay and fold and store the keepers as I see fit. Plus, I have many items in my closet that fall into future categories, so I won’t be cleaning through them for a while. I’m as anxious as you are to see if clothing for two people plus the linens can fit in this closet! One thing Kondo mentions in her book is that you have to successfully live in your own space. She says the space you have is the right amount of storage for you – I’m paraphrasing here. That thought process ties into one I discovered in my Law of Attraction studies. So, it seems to be universal. Somewhere along the line in my research, I came across the concept of having different forms of “me” in the closet, meaning the reason so many of us have so many clothes is we have the old me, the me I want to be (perhaps through many different trials and errors) and the me that I am. I found this an intriguing way to think about my belongings as I began my KonMari journey. The question we’re supposed to ask as we hold each item in hand is, “Does this spark joy?” As I was tidying, I added a caveat to that – “Do I love it so much I’m willing to move it?” – meaning, the next time I pack up for a new abode, do I want that to come with me? And, pay the moving charges! Certainly, by that time, many items in my wardrobe will have been replaced with new ones, but I kept the question in mind for future categories. Once I discovered the Stylebook app, the energy surge I had for this was so strong, it was almost scary. I didn’t know if this was for my benefit or for my readers. Either way, it was an energy I hadn’t felt in a long time and it felt good. I think most people clean through their clothes somewhat regularly, so I wasn’t sure just how much I would discard, but at the very least, I was interested in reworking the items in the closet and drawers to utilize them more efficiently. As i go through my wardrobe, I also want to identify and discard those items that I have that don’t bring me joy when I wear them. You certainly must have a few of those items, the ones where you almost dread putting them on but you haven’t found adequate replacements that make you feel good so you just keep wearing them. Well, this time they’re going! When it was time to get started, I knew I’d have to break every category down into sub-categories, just due to time constraints. I’m sure it’s a very interesting experience to clean through all your clothing at once, but smaller categories are easier for me to digest. I suspect I wouldn’t be able to walk through my bedroom or living room if I put all my clothes into a big pile, but because I take care of my Mom, it just wasn’t practical. I had to do it in chunks. I decided to start with t-shirts. I knew I had a lot but i hardly ever wear them. I put them all in a pile on my bed – sorry, I refuse to throw my good clothes on the floor. How would you feel if someone did that to you? – and was quite amazed to discover that for someone who rarely wears t-shirts, I had almost 70 of them! 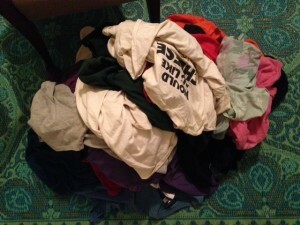 My big pile of t-shirts! I had to take them all off their hangers. I decided to do this first batch a little differently than Kondo suggests. Since she says you should feel energy when you touch an article of clothing, i decided to clean through my t-shirts with my eyes closed. To my left, I put a chair where I would place items to keep and to my right, discards. To my surprise, the final tally was actually pretty close to accurate. 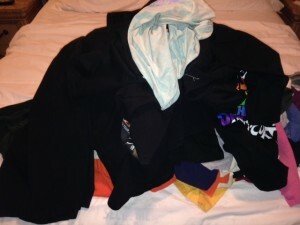 I did pull five shirts from the discard pile, but I also discarded five shirts from the keep pile once I started cataloging and folding them. All folded and snuggled in the drawer! 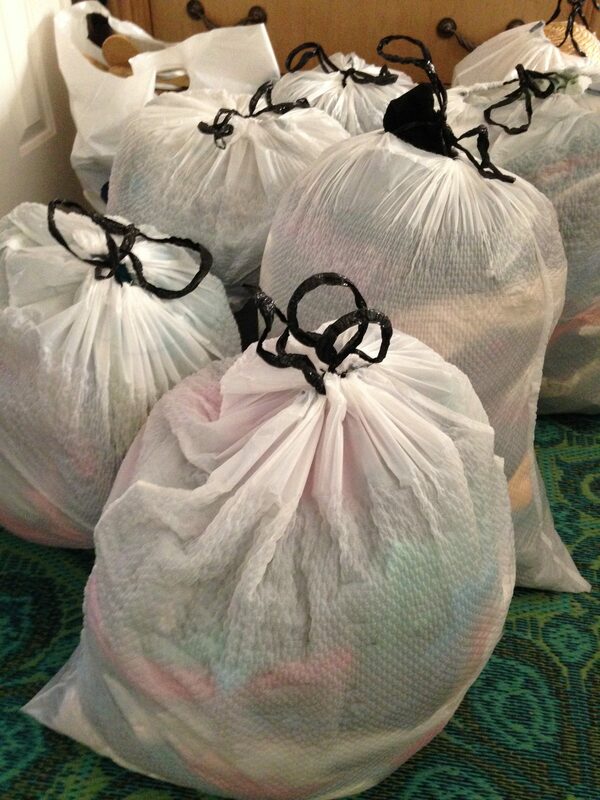 My t-shirt discards filled an entire garbage bag! I can only imagine what is yet to come once I get into more clothing categories. 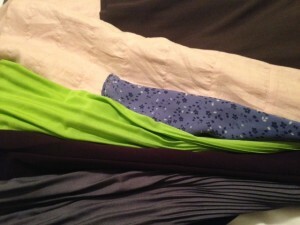 Folding was actually fun, and I’ve since used t-shirts from the drawer and they are wrinkle-free! I used to hang them because I thought that would prevent wrinkles, but in actuality, they were more wrinkled hanging, and I couldn’t tell what I had. All I saw was a sea of green or black or white sleeves. Now I can see everything I own! What category will I do next? Come back and see! This entry was posted in KonMari Method, Organizing and Tidying and tagged closet organizing, clothing organizing, Does this spark joy>, KonMari Method, Lavendaire, Law of Attraction, Marie Kondo, Organizing, Stylebook app, t-shirts, The Life-Changing Magic of Tidying Up, Tidying on August 9, 2015 by Cindi.